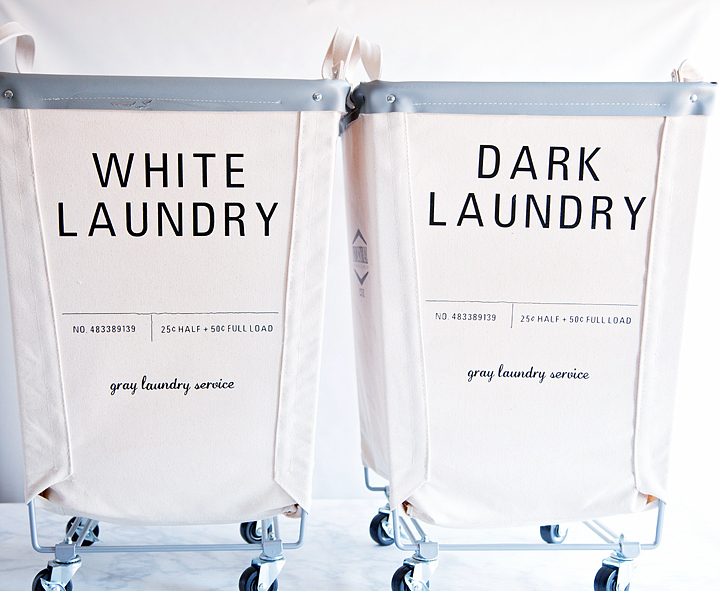 Who wants boring laundry bins? Create a little bit of sophistication for your laundry room with these canvas laundry bins coupled with this fun design that I created just for YOU! 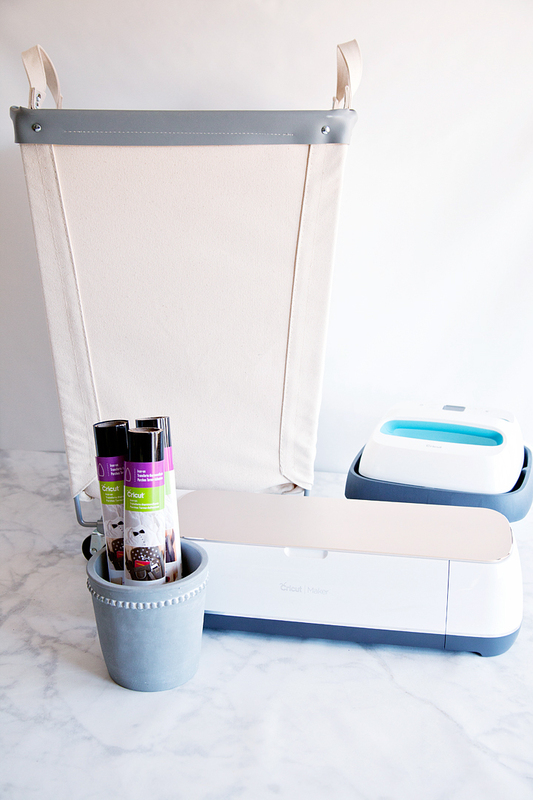 Designed with the Cricut Iron-On Lite & Cricut Easy Press in mind, I knew that my laundry dreams were about to come true. Come learn how to make a set of your own. My love affair with industrial canvas laundry bins started way too far back to even think about. It actually may have started when I saw “Annie” the first time. Remember when she escapes from the orphanage in the laundry bin? Well, I do! I’ve wanted one ever since. For my tiny laundry room, one of those large industrial bins just won’t cut it. 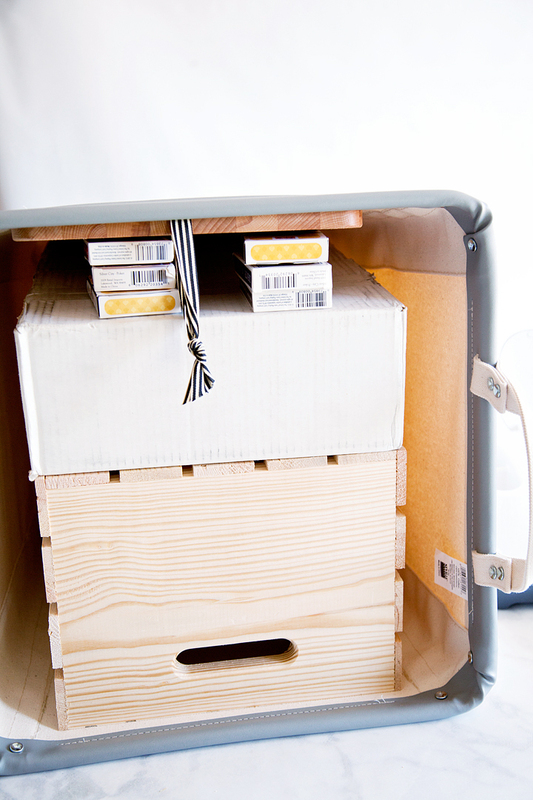 When I found these smaller scale canvas bins, my heart about skipped a beat. They are super heavy duty, they are really meant for commercial use. You’ll be passing these babies down to your grand children… They’ll become heirlooms! Oh, what a story they will tell! Of course, after only purchasing one, I had to find more because ONE just wasn’t enough! I wanted a complete set. 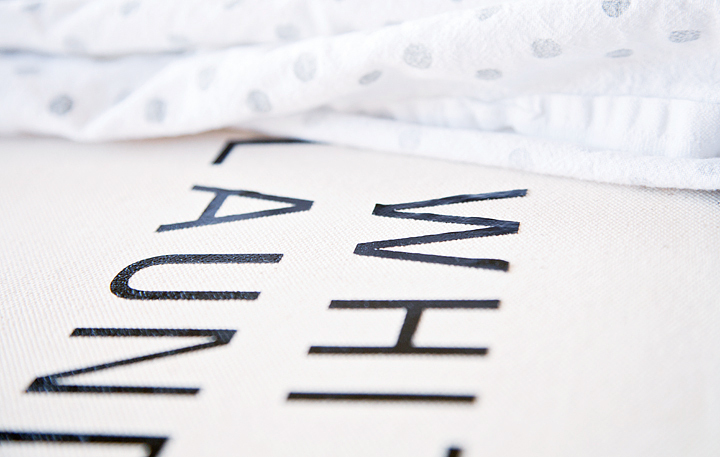 One for whites, colors, darks & linens. Yes, I know… small laundry room but, I have a plan for that also. Planning, always planning. 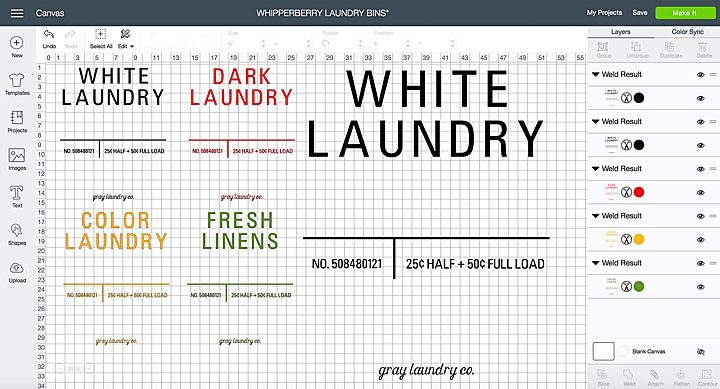 For now, I want to create a really cool, industrial looking graphic for the blank sections of the laundry bins. Of course, I head right to Cricut Design Space to WHIP something up. I love working in Cricut Design Space. It’s easy to use as a beginner and even advanced users can create all kinds of great designs within this platform. I have a tutorial on how to prepare your designs to be cut on your Cricut machine. It’s super easy and makes working on a cutting machine so much easier than other brands I have worked with. Soon I will have a tutorial video on how to actually CREATE your own designs within Cricut Design Space so, stay tuned! If you love this design and don’t want to have to recreate it yourself, you’re in LUCK! I am sharing my design file in Design Space. All you need to do is click HERE to be linked directly to Design Space. 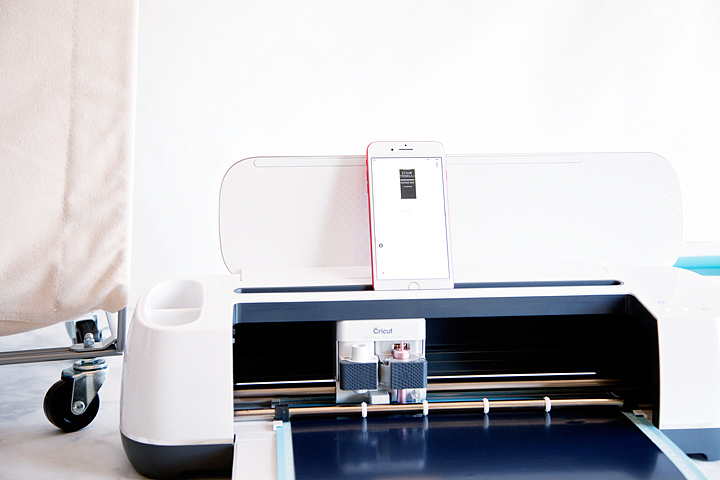 All you need to do is sign into your account, load your Cricut Iron-on Lite into your machine and click MAKE IT. Let the platform guide you through the cutting process. Depending on your subscriptions and previous purchases. You may need to purchase one of the fonts. Once you’ve purchased it, it’s yours to use from now on. Weed the design using my FAVORITE vinyl weeding tools! Well, I love all of my Cricut tools. They are seriously a guarded possession in my house. Pre-heat your Easy Press to 325˚ and set the timer for 50 seconds. Now, here’s the slightly tricky part (don’t worry, we can work through this.) In order for the heat transfer vinyl to adhere to the canvas surface, you need to heat press the vinyl on a hard surface. Well, with this laundry bin, it’s a little tricky to find a hard surface. I improvised, I placed a wood crate into the bin, topped that with a box full of cans, topped that with a wood cutting board and then wedged some decks of playing cards under the cutting board until I had a nice solid surface. I told you it was going to be a little like bubble gum and duct tape but, it totally worked! Just make sure that the surface that you are using can take the heat. DO NOT place something plastic or anything that would melt or be destroyed by the Easy Press. That would be so sad! 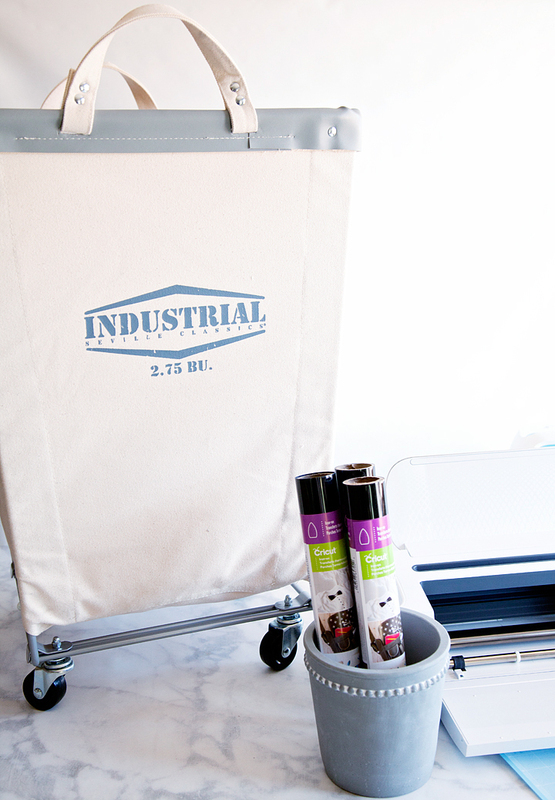 Place the weeded heat transfer vinyl onto your laundry bin, make sure it’s centered correctly. Cover design with Iron-On Protective Mat or a cotton tea towel to protect your project from the heat. 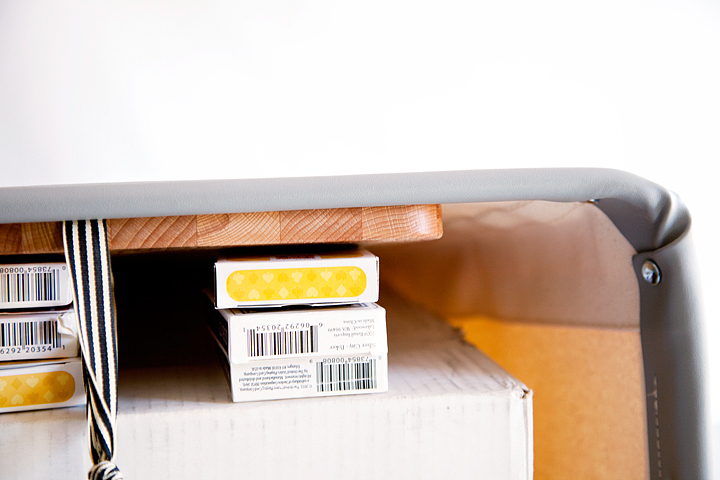 Place the Easy Press onto your bin, press the timer button and lightly press down onto the Easy Press. I found this canvas is a little tricky and it took a few passes to get the Iron-On Lite to adhere to the surface. With a little patience, I was able to get the desired results. 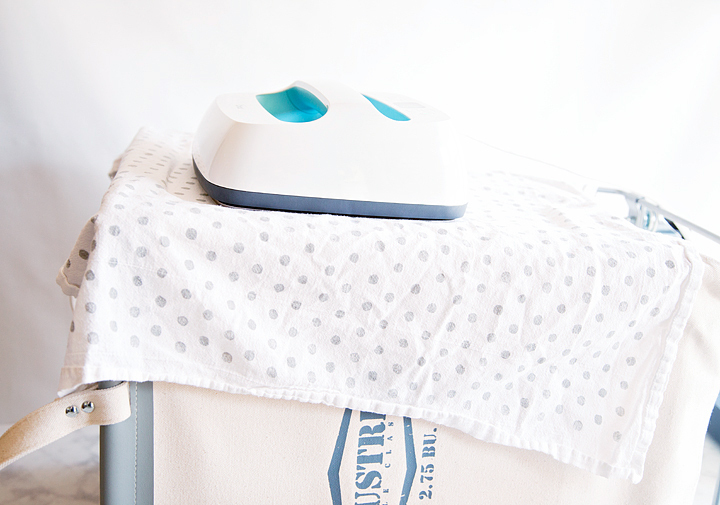 You are really looking for the Iron-On Lite to start to melt into the fibers of your fabric. PRO TIP • After a few passes with the plastic protective coating on your vinyl, try and remove the plastic film and then replace your towel or protective mat and take a few more passes. That’s how you talk a suborn surface into accepting the Iron-On Lite like a pro! That’s it! You now have a super classy canvas laundry bin that your family will fight over for generations. 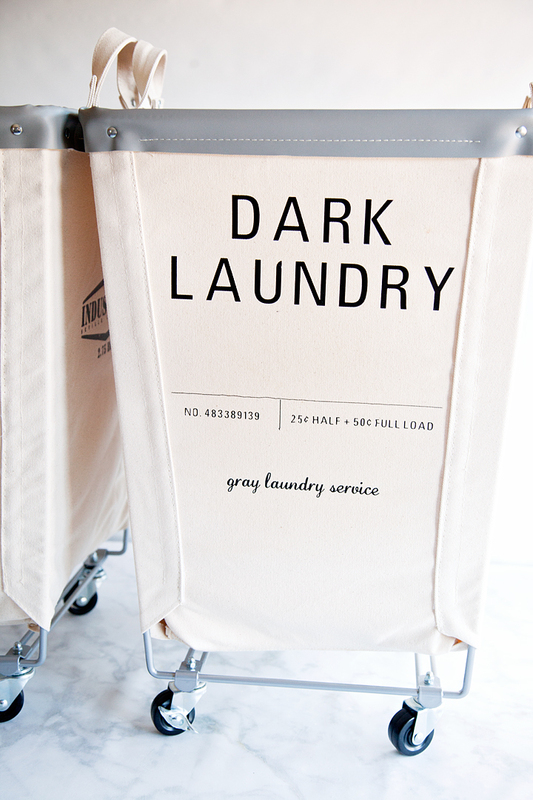 I know that’s going to make doing laundry a way more stylish chore now! What are you dying to create with all of your Cricut goodies? What are your favorite products to work with? Are you loving the Iron-On Lite like I do or are you more of a paper person. Love cutting fabric? No worries, Cricut can handle that! Tell me about your dream project. Disclaimer • This post does contain some affiliate links they are purely for tracking purposes and are not paid links. However, I did receive payment for my time and received product to help in the creative process. 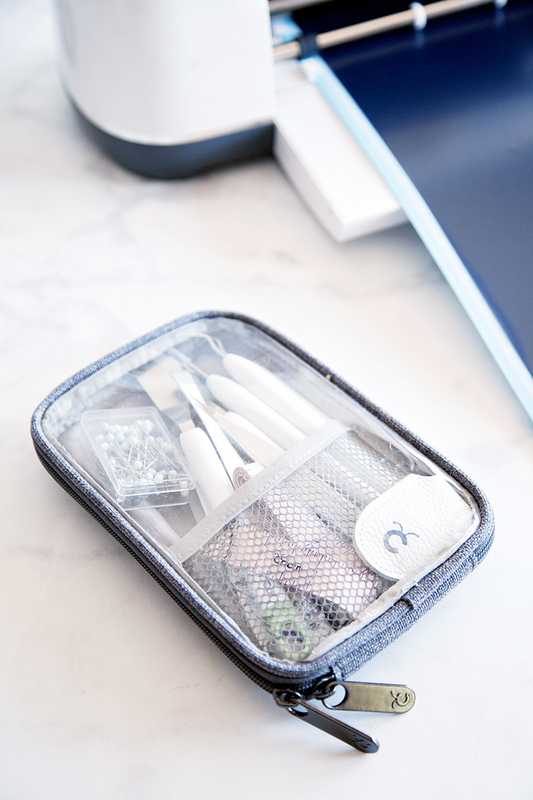 However, keep in mind, I will only share products that I truly love and use in my everyday life. Your canvas laundry bag link isn’t working on my end…know how to fix that? Thank you! Julie! Thanks for letting me know. I’ve fixed it now. I love these!!! I need a bigger laundry room! ME TOO! I’m going to build a shelf in mine so that I can have 4 of them in my tiny laundry room. Hi! I just bought three bins. Any chance I can buy the iron-ons from you?